We love to celebrate the success of our freelance community and highlight their many achievements. 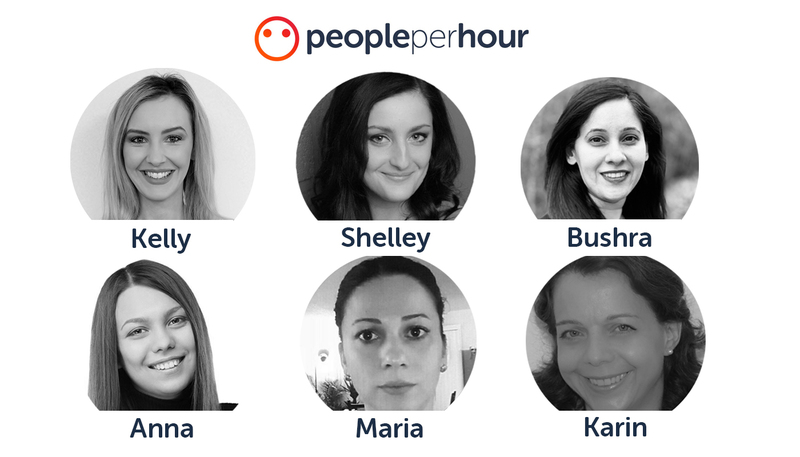 As it’s International Women’s Day on March 8th, we want to put the spotlight on some of PeoplePerHour’s amazing female freelancers. Introducing: PeoplePerHour Female Freelancer of the Year, 2019. Our team has nominated six incredibly talented freelance women who have been at the top of the leaderboard in their various categories during the last six months. Female freelancers who receive amazing reviews from buyers and always strive to give the very best customer service. All six of them are superstars but there can only be one winner. So we’re throwing open the voting to you to decide. For the rest of this month, until February 28th, you can vote for the freelance woman that you’d like to see crowned as PeoplePerHour’s Female Freelancer of the Year. Voting will then close and the winner will be announced to coincide with International Women’s Day on March 8th. Without further ado, let’s introduce you to the nominees. “Driven. Enthusiastic. Ambitious. These are the qualities that I used to transform Aggressive Growth Marketing from a part-time start-up into one of the fastest rising digital marketing firms in the UK. “The main services I offer are related to photo editing, retouching and cutout. I do some graphic design tasks for my clients as well. “Translating various types of content from English into German is my passion. I’m able to make a difference to companies as well as individuals by helping them to promote their products/services or land a job in German-speaking countries. As a freelance translator, I always work accurately, quickly and reliably. Good luck to all of our nominees! Libby is a seasoned freelance writer with a background in HR and careers advice. She manages the day-to-day social media and blog content for PeoplePerHour. When she’s not working, you can almost always find her spending as much time as possible with her two rescue dogs. You are the best engineer Maria! Happy International Women’s Day to you too Shelley! We are all winners 🙂 it is a privilege to be nominated with you all. That’s kind of you Bushra! You’re right it is really a privilege to be nominated with such powerful women! It’s a great accolade even to be nominated! Well done! Maria is a wonderful person and working with her is an honor! Great work Maria, I wish you the best of luck, and Happy International Women’s Day to all. I hope all the hard efforts pay off! I believe Maria is the only one! Sincere congratulations on your hard-earned success. You are proof that good things come to those who are willing to sacrifice to reach a worthwhile goal. My best wishes for you! Thanks Maria for your wishes. All the best to you all! Amazing to be nominated. congratulations to all fellow nominees, wish you all the best in your businesses. Maria is the best engineer and she is very clever . You are awesome Karin Schroeck-Singh? Thank you so much for your support, really appreciate Geeta!!!! You made my day! Y hope that Karin must arrive in first position. Translator Freelance ist very important for all the people that will learn two language. Congratulations Karin! Hope you win as you deserve it!! Thank you very much Sharon, really appreciate your kind words. Good luck Bushra.Hope this will help you to boost you career..Good wishes to all the nominees.Happy International Women’s Day to all the female freelancers out there ?. Go Shelley! You deserve to win Female Freelancer of the year without doubt! Best wishes for all nominees , but I vote for Bushra , stay blessed . Half of your pph earnings to Cancer Research. Very noble indeed. I give 1M votes @maria. Happy International Women’s Day to all the women on pph!! Honestly, I’m touched by this nice gesture from the PPH team, because, I always wanted to say #Thank_You, because, I always felt that women are the beating heart of the freelance community and without them it would thrive! Happy women’s day to all the working-from-home ladies, and best of luck to the bright lovely young ladies: Anna, Bushra, Karin, Kelly, Maria and Shelley. PPH should have made the voting with the user’s accounts or in a more professional way to prevent multiple-voting. I liked one of the girls and voted for her, and the find that I can vote for her over and over again and hijack this voting, but I didn’t, because basically, I don’t like cheating. But, you can’t grantee to me it’s a fair competition unless you make it serious than this! Please put more effort if you want this to be taken seriously! Thx. I wondered about that fundamental absurdity… Tempted to vote for Maria Alfred, over and over but I imagine Maria wouldn’t hear of it! Lol Anna has got 400 votes (40%) within 3 hrs, approx 1 vote every 30 seconds consistently hmmmm. I seriously think that this competition should be cancelled. I’ve seen votes going up and down and I’m not the only one to witness that. It’s just not credible anymore. Is PPH prepared to disclose the name of the APP that has been used for this voting? Thanks. “gratitude” for their “love”ly, “rewarding,” “happy,” “lucky” freelance opportunity with PeoplePerHour? Come On people!! One things I realize that they all are hard working freelancer. As a freelancer I know how hard to create a reputable profile and background. I am just thinking why I don’t have option to vote for all. I’m afraid you do… AND More than once! Love that you donate HALF your earnings to cancer research, Maria!! Killy is the good freelancer. Kind of you. Thank you! You are doing a great job Karin! Thank you very much! Thank you very much for your support Christine, means a lot! We need to get connected for a better tomorrow of women’s in India so please help. Bushra! Wish u to be a future Star? I am fan of you.. so I want to work with you any cost. This is definitely fixed – or Anna is using a robot to vote! Her vote increases every time you refresh the page! Hi Anna, It’s great that you contacted PPH. It’s been a close competition, but fun. It’s a shame about what happened, but as you said Libby and PPH have looked into it and corrected the issue. From BKS, we don’t think anything negative about you. The competition was run in honour of Women’s day so all the finalists and women generally should be celebrated. Good luck and all the best in all that you do. I agree! By far the best copywriter we worked with!